The lesser known of the many lakes within the Changtang Wildlife sanctuary, Moriri Tso lake is a twin to the Pangong Tso Lake. Located inside the Changtang wildlife sanctuary, this lake offers a scenic place of peace and tranquillity. The water body measures about 28 km in length from north to south, and about 100 feet average in depth. The lake is surrounded by barren hills, with the backdrop of beautiful snow-covered mountains. 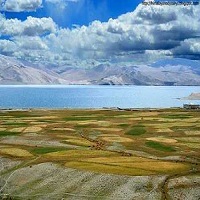 Since Moriri Tso lake is the lesser known of the two lakes, the crowd frequency is less too. Pangong lake always has many more people and is now crowded with little stalls that sell Maggi and tea. Tucked away in the remotest parts of the country makes this lake a perfect star gazing sight rendering a complete mind-stirring site.